The Welsh side are reluctant to part with Gylfi Sigurdsson, while the Red Devils want Tiemoué Bakayoko. Gylfi Sigurdsson is wanted by both Leicester and Everton. 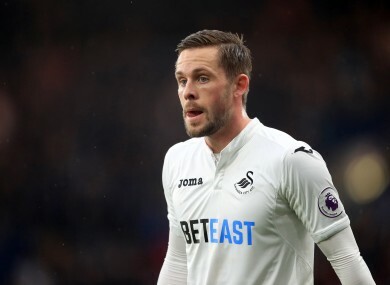 Swansea have put a £50 million (€56m) price tag on Gylfi Sigurdsson, after rejecting a bid of £40m (€45m) from Leicester, according to the BBC, while Everton have also been persistently linked with the player. Stoke’s recent acquisition of Darren Fletcher has left Glenn Whelan‘s future in doubt. Aston Villa were previously linked with the Ireland international, but now Burnley could be set to offer him a chance at regular Premier League football. Another Ireland international, Marc Wilson, could be set for a permanent move from Bournemouth to West Brom. The 29-year-old defender is valued at around £1 million. After their failed bid to sign Romelu Lukaku, Chelsea are understood to have offered €79million for Real Madrid attacker Alvaro Morata. Arsenal are understood to be preparing a third bid of €51 million for Monaco winger Thomas Lemar, having had two previous offers turned down, while €23-million rated Theo Walcott is determined to stay at the club despite interest from West Ham. Tottenham reportedly want 19-year-old Estudiantes defender Juan Foyth, who is valued at €11 million. Having all but secured the signature of Romelu Lukaku, Man United are now hoping to land another player that has been heavily linked with Chelsea, Tiemoué Bakayoko, with the Monaco midfielder valued at approximately €40 million. Meanwhile, after a frustrating summer thus far, Antonio Conte’s side are now understood to be keen on Real Madrid right-back Danilo. Reid joined Tottenham from Nottingham Forest along with Michael Dawson for a combined fee of £8 million, after a couple of impressive seasons at the City Ground. Despite a promising start at White Hart Lane, Reid never really established himself at Spurs and found himself on the periphery of the team. The Dubliner, who scored four goals in 29 appearances, also had spells at Charlton, Sunderland and Blackpool, before returning to Forest. Reid is still only 34, but retired last year, after failing to recover from a long-term injury. Email “Swansea star valued at €56 million, Man United target Monaco midfielder and all today's transfer gossip ”. Feedback on “Swansea star valued at €56 million, Man United target Monaco midfielder and all today's transfer gossip ”.